Whether you're buying pearls on holiday or online there's always some rogue ready to trouser your dosh. Not to worry. A little knowledge and a bit of common sense when it comes to marketing hype will see you through. If you haven't already, take a look at pearl qualities and grades to get an understanding of the pearl grading system. If you don't know a lot about pearls (and most people don't, including your average high-street jeweller) this page will help you avoid some of common pitfalls. Although there's no universal standard for grading pearls most reputable sellers adopt the A, AA, AAA system. Tahitian pearls may be graded using the A to AAA system or an A to D system. 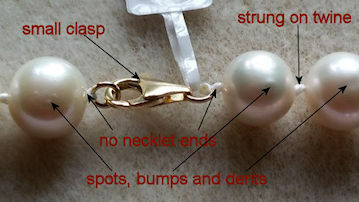 Unfortunately even this unofficial standard can be abused if a seller uses a grade like AAA to describe pearls which do not meet the generally accepted quality criteria for that grade. Sometimes, definitions like AAAA or AAA+ are used to imply superior pearls. When you see this, discount one A or the plus sign to compare products. The term 'gem quality' is a description for a pearl without fault. Such pearls are more commonly used in earrings, pendants and rings than in necklaces or bracelets. we run a small competition to find the most over-graded necklace and this'll takes some beating! It featured on a tv shopping channel labelled Grade AAAAA. It's actually not bad value for the money but five As ? Investment Grade: Pearls are a wonderful natural gem but they are not an investment and will not appreciate in value. 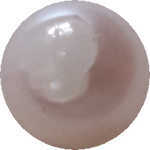 Japanese Akoya Pearls: This description has been abandoned by most pearl professionals. Japan is the world's largest importer of Chinese Akoya pearls where they are processed and re-exported. A 'Japanese Akoya Pearl Necklace' will almost certainly contain a high proportion of Chinese Akoya pearls - you can't tell the difference. Whether a pearl originated from the coastal waters of China or Japan doesn't matter. All pearls are made of the same compound (calcium carbonate) and are judged by their size, shape, lustre, surface quality and colour - not their birthplace. If someone tries to obtain a premium price for 'japanese pearls' don't ask where the pearls come from. Ask where they were farmed. Some pearls from the Philippines may be described as 'baby South Sea pearls'. Usually, they are imported freshwater pearls. The Japanese Pearl Exporters Association Inspection Tag (the blue tag) is sometimes used to denote quality. The JPEA is a voluntary organisation which examines pearls from any country and passes or fails them on the basis that they meet a minimum market standard. A blue tag doesn't mean the pearls were cultured in Japan, are top grade, or any better than pearls without a tag. Think of it in the same way as a car MOT. A certificate says only that the vehicle passes a minimum roadworthiness standard. It doesn't mean it's a good car or that it won't break down next week. Black pearls are rarely jet black but blue, green, grey, aubergine, peacock and more. Green is the predominant colour. Naturally coloured black pearls come from the pearl farms of French Polynesia (Tahitian pearls) as well as Indonesia and the Philippines. Except for freaks, there are no natural black freshwater or Akoya pearls though these may be dyed or irradiated to simulate black pearls. This isn't a problem - it doesn't harm the pearls - unless they are passed off as natural or Tahitian. Genuine Tahitian pearls are expensive and subject to stringent quality control inspections by the government. Some pearls may by-pass this scrutiny so it's sensible to buy from a trusted source. "Established in 1931, the Gemological Institute of America is the world's foremost authority on diamonds, colored stones, and pearls. The GIA does not permit anyone outside of the Institute to use our logo in any way." If a website uses the logo to imply it's approved or endorsed by the GIA it's simply not true! Think of a white marble covered with a single coat of clear nail varnish. It'll look good when new - round, shiny and flawless. After a few months or so there'll be chips in the varnish and soon whole areas will flake or peel off. That's pretty much what can happen when the nacre covering a bead nucleated pearl is too thin. Thin nacre can be a disappointment with seawater pearls (it's not usually a problem with Tahitian or South Sea pearls and freshwater pearls are solid nacre). Commercial pressure may make farms harvest pearls early, with nacre thickness less than 0.2mm. It's tricky to spot thin nacre on delivery. If it's cracked or peeling around the drill holes it's not an good sign. The nacre on this 7mm Akoya pearl has split off by the drill hole - exposing the bead underneath. Ok - we're biased, but many 'UK' pearl sellers you find on the first page of Google and other search engines are based in the USA or China. Just because a seller has a domain name like pearlsite.co.uk doesn't mean it has more than an accomodation address here, if that. Does the price include import taxes? If not, you will have to pay the courier an extra 25-30% in vat, duty and handling charges. Beware suppliers sending items labelled 'gift'. Customs are onto this and take a dim view! If you are unhappy with your purchase how will you return it? One-off courier charges are expensive and insurance is minimal. You can, in theory, reclaim vat and duty on returned goods but the procedures are cumbersome. "Traders should state on their web site which country's laws apply. Your rights will depend on the law of that country." "Retail £1350. Our price £270. You save 80%!!!" Unless the advertiser can prove the 'retail price', this claim is, at best, 'marketing puff'. From a specialist internet pearl retailer expect to pay about a half to two thirds the price of an equivalent pearl product from a department store or high-street jeweller. Most pearl specialists buy their pearls direct from pearl farms or processors. Carat gold, gold vermeil, gold-filled or gold-plated. It makes a big difference to the price. They're cultured pearls and they look the same on screen but one of these 8mm pairs costs 4 times the other. Stock photos like this... ...are used by both quality pearl vendors and by tat merchants. Go by many names like simulated, organic, faux and semi-cultured. Good imitations are made from beads of glass, ceramic or shell and coated with a varnish of laquer and ground fish scales to mimic the pearl surface. Well made imitations can be quite hard to spot. One way is the 'tooth test'. Gently rub the pearl backwards and forwards under the cutting edge of your top front teeth. Don't bite it. A real pearl should feel slightly gritty due to it's crystalline structure. An imitation pearl will feel smooth. This is not an infallible test. The answer is often disappointing. Most pearl sellers on the internet are honest retailers. You know enough now to avoid the rogues.